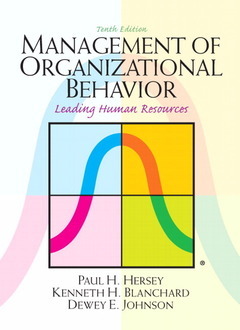 Management of organizational behavior (10th ed ) Hersey Paul, Blanchard Kenneth H., Johnson Dewey E.
Auteurs : Hersey Paul, Blanchard Kenneth H., Johnson Dewey E.
Forty years in the making, Management of Organizational Behavior is a readable text that makes behavioral sciences come alive through real life examples and progressive ideology. Are Management and Leadership Really Necessary? Is There a Best Style of Leadership? Is There a Best Type of Power? What’s in It for the Manager? What Do We Want to Influence? How Is the Person Doing Now? Problems and Their Ownership—Who’s Got the Problem? Is There Only One Appropriate Styles? How Important Is Effective Communication? Is There a “Best” Pattern of Communication? Is There a “Best” Strategy for Change?